Power is a combination of strength and explosiveness. It is created by releasing maximum muscular force at maximum speed. To increase power, you must increase both speed and strength. By exerting strength with speed, you take advantage of both the force generated by the muscles and the momentum created through the speed. Explosive power – Explosive power is the ability to exert maximum force in one or a series of dynamic acts. Example: Breaking a board with a punch. Static power – Static power is the maximum force a person can exert for a short period. Example: Bench press. Dynamic Power – Dynamic power is the ability to exert muscular force repeatedly or continuously over time. Example: Heavy bag workout. Power is derived from muscular ability. The human body contains over 400 muscles that can be broken in two classes: smooth and striated. Smooth muscles are those that perform the involuntary functions of the body like circulation and digestion. Striated muscles are those that can be voluntarily contracted, such as the muscle groups in the arms and legs. These muscles are the source of power. Striated muscles are made up of two types of fibers: slow twitch and fast twitch. Slow twitch fibers are designed for activity that must be sustained over a long time like distance running. They have a high capacity for aerobic energy production and can remain active for a long time while producing relatively small amounts of lactic acid. This is important because lactic acid build-up in the muscle tissue causes the muscle to fatigue and eventually renders it unable to continue working. Low levels of lactic acid mean more capacity for work. People who have a high percentage of slow twitch fibers excel at endurance activities. Conversely, people with a high percentage of fast twitch fibers excel in explosive strength activities. Fast twitch fibers have a great capacity for anaerobic energy production, which allows them to produce intense power and speed of contraction. This intensive work also causes them to accumulate large amounts of lactic acid and fatigue quickly. Based on this, the answer to developing power seems obvious – increase the percentage of fast twitch muscle fibers in your body. Unfortunately, this is not possible. The ratio of fast and slow twitch muscle fibers is determined early in life and cannot be markedly changed. Studies have shown that distance runners have high percentages of slow twitch fibers and sprinters have high percentages of fast twitch fibers. Yet it has been concluded that the activity in which they participate is not responsible for this phenomenon. Instead, it is believed that distance runners take up endurance sports because they naturally excel in this area. In the same respect, others are naturally fast and gravitate toward the speed and power oriented sports in which they excel. Although you cannot change the ratio of muscle fibers, you can improve what you have. In the average person, slow and fast twitch muscle fibers are generally intermingled, with a higher percentage of fast twitch fibers present. Through training, you can improve the metabolic efficiency of either type of muscle fiber. By training for explosive strength you stress the fast twitch muscle fibers repeatedly, causing them to become stimulated and teaching them to work more efficiently. Besides understanding the types of muscles you have, you must have an understanding of how your muscles work. There are two basic ways that force is generated and controlled. The contraction of a muscle is determined by the types of muscle fibers recruited and the firing rate of the neurons within the muscle. First, let’s look at how your body decides which types of muscle fibers to use. The voluntary contraction of a muscle begins with the recruitment of the smallest units of slow twitch muscles. These motor units (muscle fiber groups) have the lowest response threshold, create the least amount of tension and are the most resistant to fatigue. As muscle tension increases, more motor units are recruited from the larger fast twitch fibers. As tension continues to rise, fewer motor units need to be activated because the large fast twitch units contain more plentiful and more powerful muscle fibers. But because these large fibers are the ones that generate peak tension in the muscle, they fatigue quickly and require more recovery time. As a practical illustration, compare the difference in muscle fatigue you feel when walking and when sprinting. If you walk one mile or sprint one mile, you are using the same basic muscle groups over the same distance. But few people can sprint even half the distance they can walk before their legs simply refuse to go any farther. Walking requires less tension in the muscles and therefore relies on the low threshold, low tension motor units. Sprinting, on the other hand, requires maximum muscle tension for every stride. The muscle fibers’ ability to produce maximum tension repeatedly over long periods of time is poor and the legs tire quickly. Besides the amount and type of muscle fibers recruited, muscle tension and speed of contraction is determined by the rate at which the skeletomotor neurons stimulate the muscle fibers. The more frequently the neurons fire, the more tension that is produced in the muscle. At peak tension, the neuron fires so rapidly that the muscle fiber is unable to relax from one stimulation to the next. The result is the generation of maximum force. Power consists of both speed and strength. Since speed is very important to martial artists, we will focus on improving strength in this section and cover speed in more depth in the next chapter. 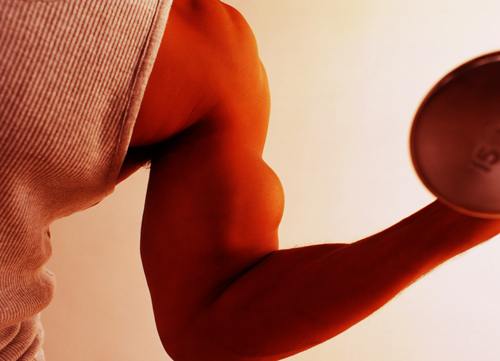 Strength can be increased by repeatedly stressing the target muscle groups over time. There are three common ways of creating the required stress: isotonic, isometric and isokinetic exercise. Isokinetic exercise requires specific exercise machines, so this section will examine the more practical methods of isometric and isotonic exercise. Normal muscle movement is isotonic. One muscle lengthens while the other contracts in complementary pairs. A good example of isotonic movement is weight training. As you lift the weight and then return it to its original position, your muscles lengthen and contract alternately through the full range of motion. To understand isometric exercise, imagine you try to lift the same weight and it does not move. No matter how hard you work it remains in the same place. The muscular response you experience when applying force against an immovable object such as this is an isometric contraction. One muscle lengthens and the opposing muscle is prevented from contracting because the stationary weight prevents the muscles from moving through their full range of motion. Building tension in the muscle while preventing it from shortening was once thought to bring dramatic gains in strength. Studies of isometric exercise have since proven it to be an effective, but not miraculous, way of improving strength gradually. One drawback of isometric exercise is that the muscle is strengthened only in the exact position of the isometric contraction. If you push against the floor with your elbow bent at a ninety degree angle, your arm muscles are strengthened in that position, but you have to repeat the push at eighty degrees, seventy degrees and every other position between. Doing simple push-ups, an isotonic exercise, can be much more efficient because you work the entire range of motion, and strengthen the corresponding muscles, in a single action. Too much stress can easily cause time-loss injuries, injuries that require you to take time off from your exercise program to recover. Taking time off means you have to start over where you left off, or more likely, at a lower level than when you were injured. To prevent overuse and stress injuries, work at your own pace. Don’t try to get in shape quickly by doing 200 sit-ups on your first day. Start with a comfortable number of each exercise. To determine a good number of repetitions, work through as many repetitions as you can until you feel minor discomfort in your muscles. Do a few more repetitions and stop there. Stay with this number until you can complete it without difficulty and then add a few more repetitions. The last ten to twenty percent of the repetitions should always be fairly difficult to complete. Example: If you can do thirty sit-ups comfortably, set thirty-five as your starting point. After a few sessions, thirty five will become comfortable and you can add more repetitions. As you get into higher repetitions, you may begin to advance more slowly than you did at first. This is normal. Stay at your current number of repetitions as long as you need to. A gradual increase in work load will allow to reap maximum benefits with minimal injuries. Execute exercises exactly as you learn them. Cheating on an exercise to squeeze out a few extra repetitions will do more harm than good in the long run. Failing to flex your arms fully during push-ups may allow you to do ten more than usual, but it will have less effect on your arm strength than push-ups done correctly. If you can only do five push-ups correctly, then do just five. If you really stick to the correct form and are consistent, five will turn into ten and ten into twenty and so on. Each exercise is designed to work specific muscles and produce specific benefits. Make an effort to understand what these benefits are and stick to the correct way of performing each movement. For best results, do strengthening exercises two to three times a week. Strength training causes minor tears in your muscle fibers that need about forty-eight hours to heal fully. During this recovery period your muscles become stronger and thicker creating the increases in size and strength that you are training so hard to achieve. If you interrupt the recovery period, you hinder the efforts of your body to produce the results you want. This entry was posted in Fitness and Training and tagged articles, fitness, power, strength. Bookmark the permalink. Enter your email address to receive notifications of new articles and products by email. The official Junsado Instructional Text. Junsado is the way of combat expert. 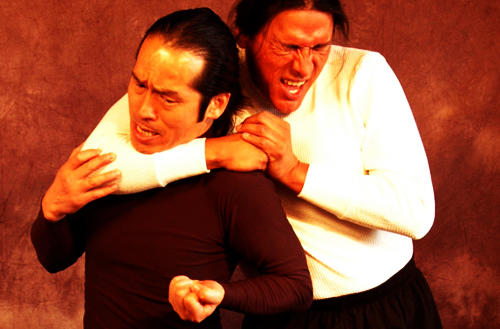 Junsado techniques are grounded in the principles of change: changes in you, changes in your opponent and changes in the environment are all considered in Junsado strategy. It is a living art that evolves and adapts to the individual fighter and environment. Sang H. Kim, founder of Junsado, has over 40 years of experience in training and teaching martial arts. He has taught tens of thousands of students in his own schools and at seminars in Europe, Asia and North America and reached millions more through his books, videos and DVDs. He has a PhD in Exercise Science and is the creator of MBX-12.